FUNNY and SURPRISING Our naughty gnome looks quite pleased with himself as he bares his bottom waiting to shock some unsuspecting person who happens upon him in the garden. It has a perfect size to tuck into the bushes or a potted plant. FITS IN MANY PLACES It’s good to have in your home and office lawns, backyards, bathroom and kitchen decoration.Fun decoration prank – Looking for a fun prank that will make your friends laugh – here you have it, perfect for your kitchen, front door, backyard, office or vacation house. 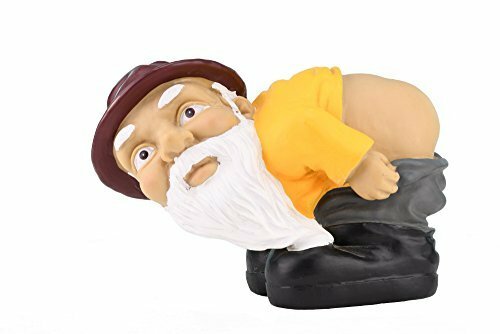 Made of PVC – This Mooning Gnome has a red hat, yellow long sleeve shirt and gray pants.